Thanks to the wonders of technology I am heading across the pond without need of transportation. This year my associate, gallery director and the person responsible for making something out of my random picture taking, Vince Hickman, has gone over and sent me video and comment. This week you have his pictures and video with my text. Biennale des Antiquaires 2012 from Stiebel, Ltd. on Vimeo. Vince and his wife Heidi arrived in Paris last Thursday morning and shortly thereafter they were raring to go to the opening of the Biennale at the fabulous Grand Palais off of the Champs Elysée. There was just one problem and that was getting in. They gave away too many tickets and at the same time beefed up security because of the recent riots in the mid-east. The crowds waiting outside stretched the length of the huge Grand Palais and across the street to the Petit Palais. After an hour and a half they’d had enough and called a friendly exhibitor who came out and snuck them in a side door. It’s nice to have good friends! Opening Night - Biennale - Paris - 2012 from Stiebel, Ltd. on Vimeo. I remember bad crowds In recent years but never like this. I guess the organizers believe that these kinds of crowds bring excitement to the event. Personally, I think it brings frustration and this was evidenced by the numbers that just left without going in. After all it does last from the opening on September 13 until September 23 and the hours run from 11am to 8pm and on 3 nights they go on until 11pm, a real endurance test for the exhibitors. On the other hand if you leave and come back another day you may have to pay the entry fee of 30 Euros, close to $40 to get in, twice as expensive as most U.S. Art Fairs. One of the reasons for the crowd was the much anticipated and hyped design of the fair this year by the famous Karl Lagerfeld, the designer for Chanel, and art collector. It seems, however, that he fumbled the ball, or should I say balloon, this time around. It amounted to what my younger son would call, “a big whoop!” The only décor in the entire place was the large balloon at the center as you walked into the fair. Lagerfeld said he also wanted to accentuate the beautiful glass ceiling of the Grand Palais but at night it is not evident. 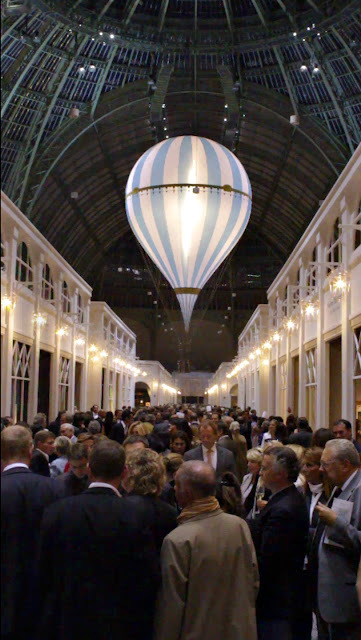 The balloon was at the center of a large round bar, which was mobbed all evening. There were, however, satellite bars all over with good food and drink. The booths were also better integrated than in the past and the Jewelry exhibits were not constricted to one section but scattered throughout the fair. A new section of younger, less established dealers also seemed to meet with the publics’ approval. 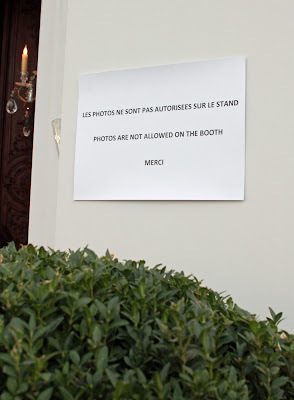 Unfortunately for us, most of the booths had signs that forbid photography. That has not been a problem in the past so Vince had not requested a press pass. Come to think of it, a pass might have helped getting in without the hassle! In spite of this Vince and Heidi found the fair overall most impressive and, as one must, they went back on a quieter day to view the booths more carefully. In any case, I feel that openings are more for chatting than viewing. As you might expect Vince and Heidi had different favorite booths. Heidi’s was Van Cleef and Arpels, not just because of the beautiful Jewelry but it was the fabulous and innovative design of the booth. 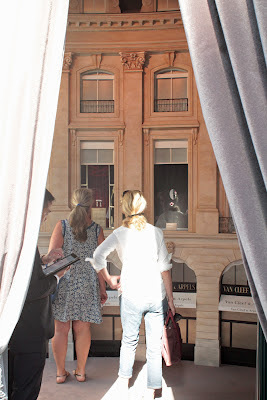 They had a street of Parisian houses in small scale that led into a room of fantasy wedding dresses that rotated behind screens making them look as if they were being projected. What a great way to create an appropriate atmosphere for their fine jewelry. Vince went in a very different direction. He liked Bernard Croissy’s booth, a dealer in historic arms. Croissy has said that most of his clients go for his highly ornamented swords but Vince picked out a rifle made for a right handed shooter and designed so that it could probably not have been shot accurately by anyone other than the man who had commissioned it. It was made circa 1635 and attributed to the Austrian "Meister der Tierkopfranke" with elaborately engraved silver, carved ivory and fruitwood throughout. Among the galleries that are more in our field, the Galerie Kraemer built their booth around a single artist, Jean Henri Riesener, Marie Antoinette’s favorite cabinetmaker. One of several highlights in their booth was a fabulous marquetry commode with a beautiful flower bouquet in the center. 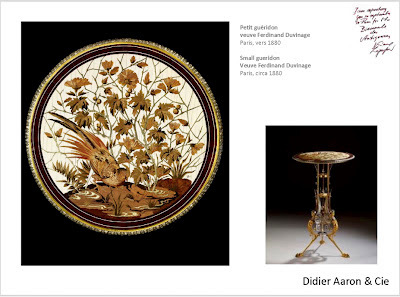 Didier Aaron who has galleries in Paris, London and New York showed off many old master paintings but what struck Vince the most was a delicate late nineteenth century gueridon, a circular occasional table by the Veuve Ferdinand Duvinage. 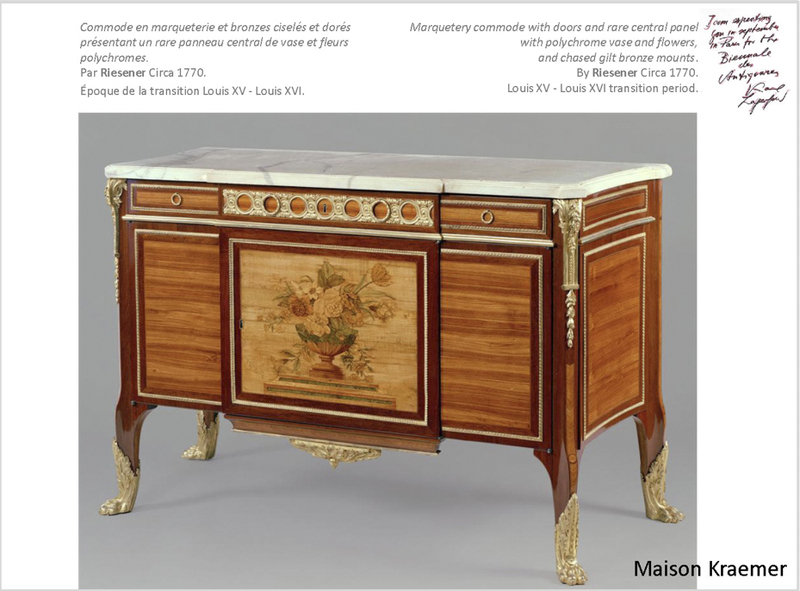 The top of the table is done in a lovely combination of marquetry and ivory inlay. One of the dealers in the fair said that they had not expected much from the event but already by the second day they were happy. That has to be considered a successful fair by any standard.